This week I did a 10 minute talk for the history department research day at MMU. It was my first talk and my nerves almost got the better of me! I gabbled a little fast, and wish I’d tried to say less and taken my time, instead of letting my thoughts run away. I’m glad that I had the chance to practice speaking in a friendly environment, and I learnt a lot about good presenting techniques from some of the other speakers. I’ve applied for a couple of conferences in November so fingers crossed I get a paper accepted and then I’ll be able to deliver a full 20 minute paper. My research this week has led me to think about father-son relationships. I’m just starting to read Maurice’s diary from 1920. This was a big year for Maurice in more ways than one. It is the first year he attempted to travel to Kenya, the country that became so important to him in the following years. It is the year he met the Selwood family on board the P&O Kalyan, whose son Kenneth would become his great friend and executor of his estate at his death. Most significantly for me, it is the year that he begins to number his collected animals and other objects, so beginning the cataloguing and recording of his now ‘official’ collection. But perhaps most significant, it was the year that he inherited the title of Baron of Tatton and the land and fortune that came with it on the death of his father. ‘there are only 14 Barbary apes on the Rock, being kept down to that number because they carry consumption. They are fed every day; are the size of a man; the old apes throw most of the young ones over the cliff’. The journey to East Africa is long and tiresome compared to the quicker flights that Maurice was able to take advantage of in the 1950s, and the ship also stops at Marseilles, Naples, Port Said and Port Sudan before it reaches Aden on September 16th. 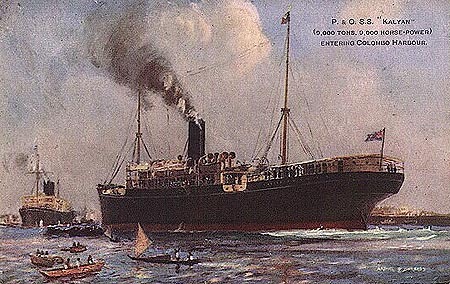 Suddenly on September 17th, having made no mention why, Maurice is awaiting the arrive of the P&O ship Kaylan back to England, which has been delayed due to a stoker strike. It sets off on the 19th, and arrives into Marseilles on the 30th. Maurice doesn’t wait for it to complete the journey, presumably as he is in a great hurry to get home, so he jumps ship, taking a train into Paris and arriving into London via Calais on October 1st. So ends his diary, and there is no more word from Maurice until June 1921 when he sets sail again to try and make it to Kenya. The reason of course for his hasty return was that he was notified of the death of his father, Alan de Tatton Egerton. It does seem to me to be unusual that this massive event isn’t mentioned specifically in the diary, even though I have to accept that the main purpose of the diaries was to record his travels and collecting, and not sentimental feelings. Yet later on, Maurice does mention the deaths of several friends, including Hugh Cholmondeley, Lord Delamere, in 1931. I’ve been told that later still, at the death of his mother, again not a ripple of emotion is recorded in his diary, and this time he doesn’t even bother making the journey home. I’m looking forward to confirming that when I come to read that diary later on. We have always speculated at Tatton that he had a difficult relationship with his mother, but reading how desperate Maurice was to get home ASAP has made me curious to find out more about Maurice’s relationship with his father. Surely a father must be the key influence on a son’s life, and as ever, I need to know more about how Maurice became Maurice. Yesterday I had a nosy through some files and records at Tatton to find out more. I’ve always thought how sad and bitter tasting it must be for aristocrats to finally come into their inheritance and titles, as it would generally have meant that they had lost their father or close relation. They might finally gain independence and financial freedom, but they must first arrange or attend the funeral of their relative. 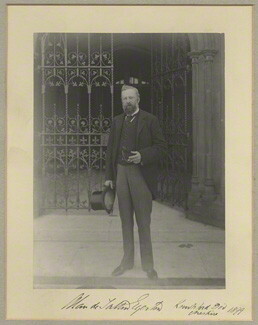 Although I know that Alan de Tatton made some important technological improvements to Tatton and seemed to have been a really interesting modern man, I think he is sometimes overlooked as a noteworthy figure, especially in comparison to his elder brother Wilbraham, the 2nd Baron and later Earl Egerton, whose achievements in statecraft and industry are celebrated more widely. The Guardian yearbook of 1912 gives a biographical account of Alan, celebrating his achievements at Eton, in the military, in the masons and later in politics, all usual and expected career choices for a young man from an aristocratic background. He was interested in game hunting and travel, and these were obviously the interests and talents he passed onto Maurice. Alan first took Maurice abroad, and they were together in Zimbabwe in 1896 (the year of Maurice’s first diary) when the Matabele uprising took place. Alan married well, presumably pleasing his parents, and chose Anna Lousia Watson-Taylor, eldest daughter of Simon Watson Taylor of Erlestoke Park, Wiltshire. That family had made their fortune in sugar plantations in Jamaica (and so presumably through the salve trade). Although there had been a blip in their fortunes in the early 19th century, seeing the sale of the contents of Erlestoke in a 24-day auction of 3,572 lots in 1832, Simon had done well to claw the family back into respectability and had been restored to Erlestoke in 1844. The marriage produced three boys, but sadly the eldest William died aged 2, and Cecil the second son died aged 17. Maurice was their only surviving child. Something Maurice had in common with his father was that they were both younger sons, and for both of them growing up it would probably have seemed unlikely that they would inherit the Barony of Tatton and the Tatton estate. Alan’s father William is supposed to have said that he wanted him to learn a useful profession. So perhaps more unusually for someone of his background, and something that isn’t mentioned in the Guardian biography, is that Alan spent three years in training with the engineering firm Messrs. Sharp, Stewart & Co, arriving at 8am and working a full day like any other working class man. On the sad death of his first son William, the death certificate records Alan’s profession as ‘Civil Engineer’. Perhaps this training towards a profession inspired Alan to direct his son Maurice in a similar way. Although at first he was intended for the diplomatic service, his family noticed his real talents were in land management, and so he completed several terms at agricultural college. I think I can see patterns in the upbringing of Alan and Maurice, suggesting that Alan wanted his son to lead a useful life and make the most of his talents as he himself had done. It seems obvious that Maurice should return hastily to England on hearing of Alan’s death as he would need to make necessary arrangements to take over the title and estate. But I hope that a lot of his haste was due to the fact that he had lost a father whom he cared about. Thanks to Maurice’s lack of emotion in his records, I’ll never really know. I still wonder why Maurice never wanted to experience being a father himself. Could this be down to accepting the end of the influence of his class, or his reluctance following an unhappy childhood, rather than just the absence of opportunity or finding the time? But his kindness to local boys in Knutsford and boys in his employment suggest that if he had been a father, he probably would have raised them to enjoy the privileges of being increasingly free to explore and find a place in an expanding world… a legacy given to him by his own father. Hello. I came across a photocopy of an article on Alan de Tatton Egerton from the 1912 Guardian yearbook in our archive at Tatton Park. I don’t know if we have the full copy of the book, but I will have a dig around when I go in to work tomorrow. thank you, that would be great. Hi, is there any chance you could send me a copy of the article on Alan de Tatton Egerton? Hi Debbie, let me double check with work if it’s ok to do that and I will try to copy it at the end of the week when I’m in. Everything is very busy there with Christmas openings at the moment!